Piper Martin Mckay is passionate about the Great Highland Scottish Bagpipes and the positive impact that it makes each and every day. 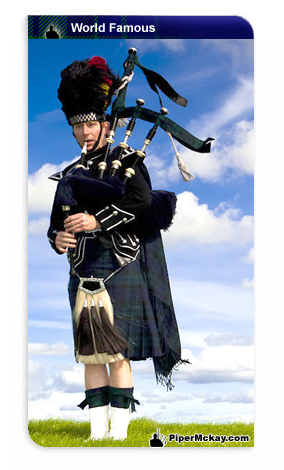 PiperMckay.com promotes the bagpipes of Scotland, adding sizzle to all kinds of events, Making Events Magic! The Great Highland Bagpipes are an ancient old instrument, it is thought that the bagpipes evolved from an instrument similar to a Hornpipe or Shawm pron. (FONE). The Romans also played a major part in the distribution of the bagpipes. It is said that the Roman army used to march to bagpipe music. Some historians even suggest that Emperor Nero (who ruled from 54 to 68 AD) was a keen piper. The bagpipes were being played in Scotland by the 14th century. They achieved their recognisable form in the late 16th and 17th centuries, with decorated chanter and drones. Piper Martin Mckay looks forward to welcoming you all and helping you to discover the true magic of the Bagpipes.